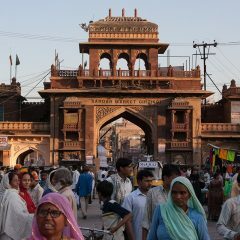 Once you enter the blue labyrinth of Rajasthan’s second largest city – one of our favorite places in the country – it is easy to lose track of time and space. But never fear. 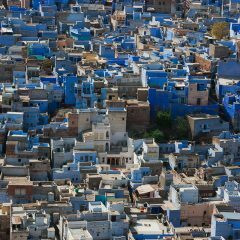 To help you make the most of your stay, we have compiled a list of our favorite things to do and best places to visit in Jodhpur. The city’s landmark fortress is a sight to behold floating in a sea of blue. Situated on a dramatic hill of raw rock, magnificent Mehrangarh Fort is not only one of Rajastan’s best organized museums, it also boasts sweeping panoramic views, lavishly-decked out interiors, and an expansive Mughal art collection. 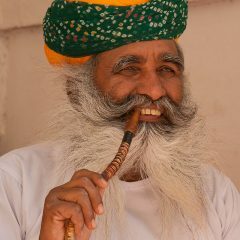 Check out the elaborate palanquins and elephant howdahs, and don’t miss the colorful Rajasthani turbans. The well-designed audio tour is a must, featuring interesting interviews with the Jodhpur royal family, which once resided in the fort. 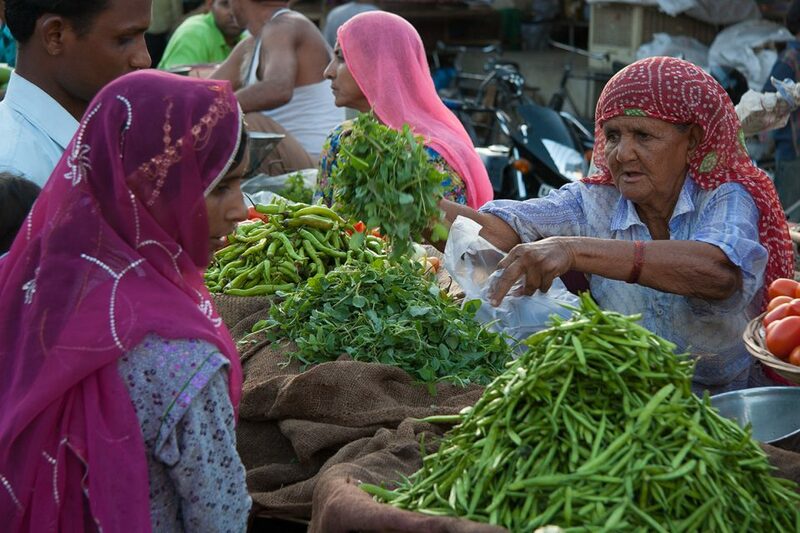 Jodhpur’s photogenic Sardar Market is a bustling shopping paradise for locals and tourists alike. It’s the perfect place to find hand-woven textiles, fresh veggies, silver jewelry, and fragrant spices. The historic market is also great for people-watching. 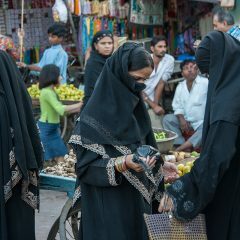 As you push your way through the bazaar, women in sequined saris haggle over bangles, children balance bags of okra on their heads, and whole families are out to feast. 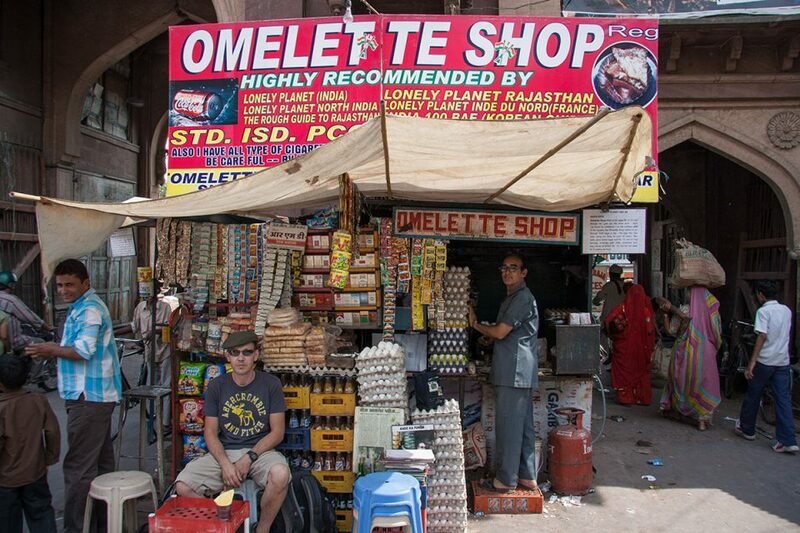 Make sure you try a delicious saffron lassi (or two) from the vendors around the century-old Ghanta Ghar clock tower. 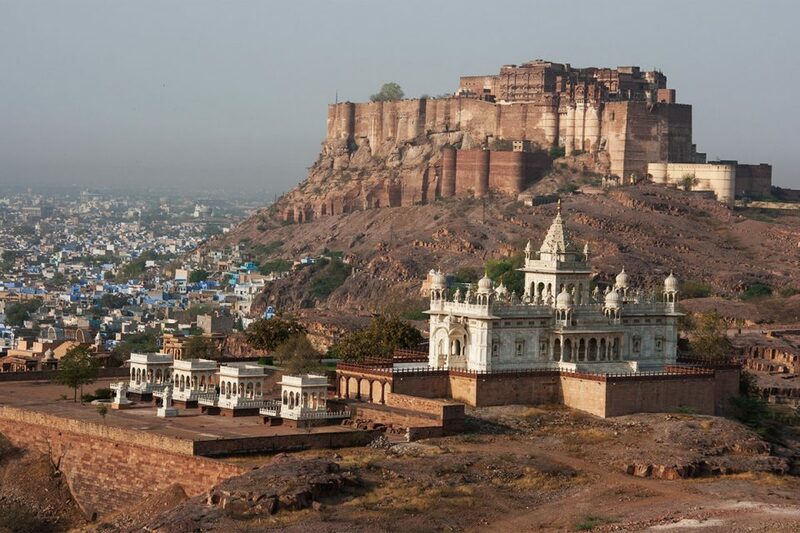 If Mehrangarh Fort has inspired you to royally splurge on a heritage hotel, you don’t have to go very far. 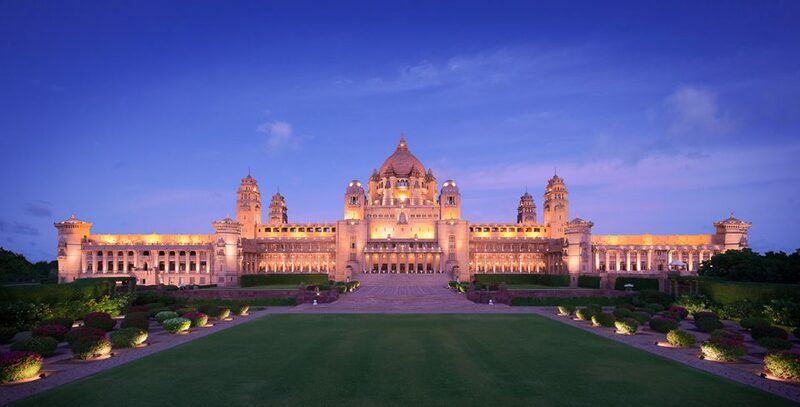 Jodhpur’s Umaid Bhawan Palace is located a short distance from the old city on Chittar Hill. 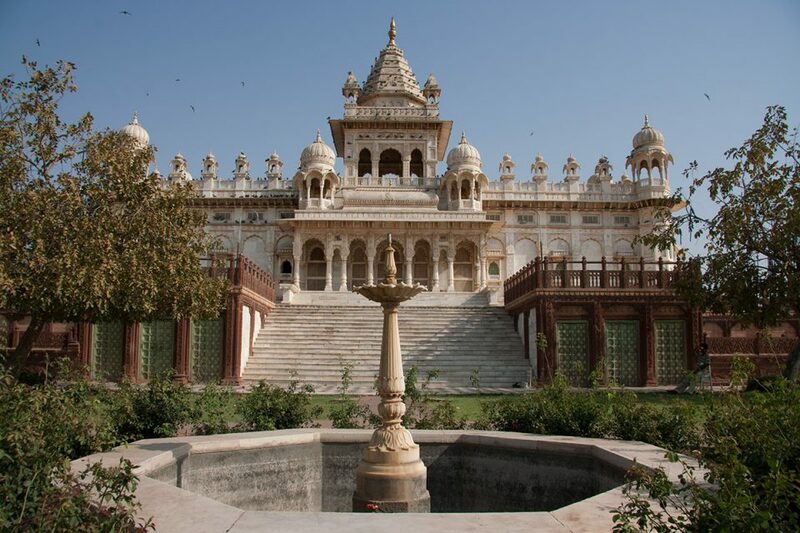 The gorgeous sandstone-and-marble palace, built by the Maharaja of Jodhpur, functions both as a residence for the royal family AND a five-star luxury hotel with stunning Art Deco rooms and suites. 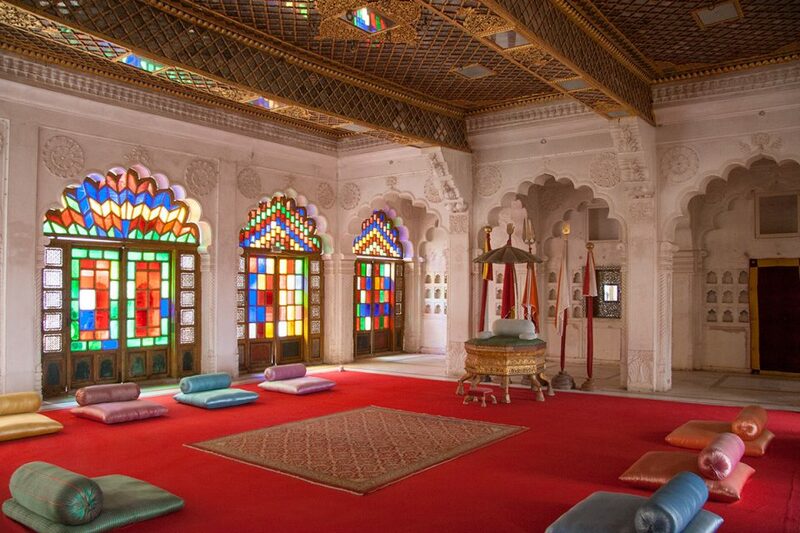 Where else in the world can you live under the same roof as a maharaja? (Or maharani, to be politically correct). We highly encourage you to get off the beaten path and explore the city’s quiet backstreets away from the buzz of the market area. Stroll through the residential neighborhoods with their gorgeous multi-level abodes, intricate latticed windows, and tangled knots of electric wires. 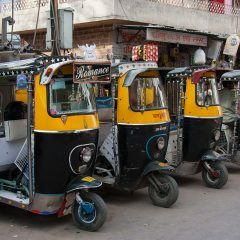 Splashes of color, such as green shutters and Bollywood posters, pop against the powder blue walls, and some lanes are so narrow that you can barely squeeze by passing locals. It’s awesome. It’s also a photographer’s playground and a place for some well-deserved solitude. 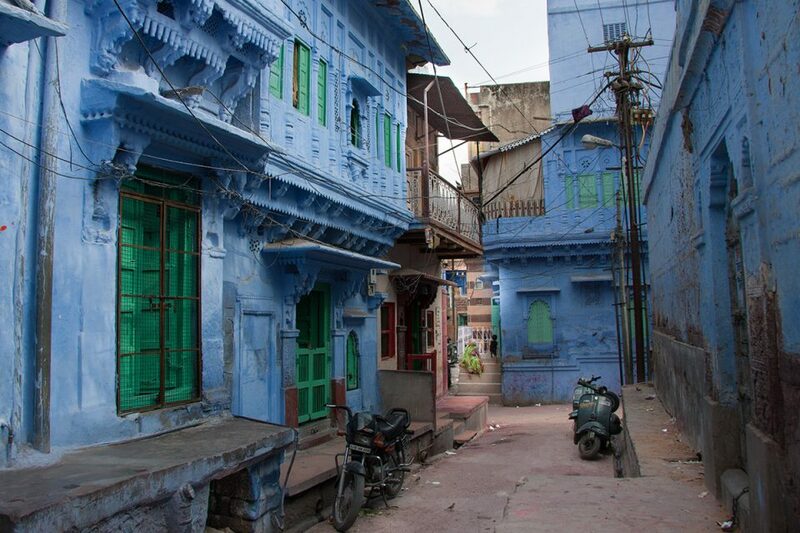 One of Jodhpur biggest tourist attractions – by surface area – is the Thar Desert. The Blue City is surrounded by a surreal scrub forest landscape that beckons to be explored. And what better way than by camel. Most camel tours out of Jodhpur start in Osian and include a visit to a Bishnoi village and the beautiful Sachiya Mata and Mahavira Temples. 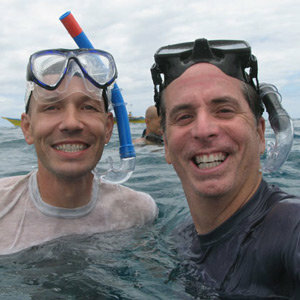 Longer itineraries are also possible. 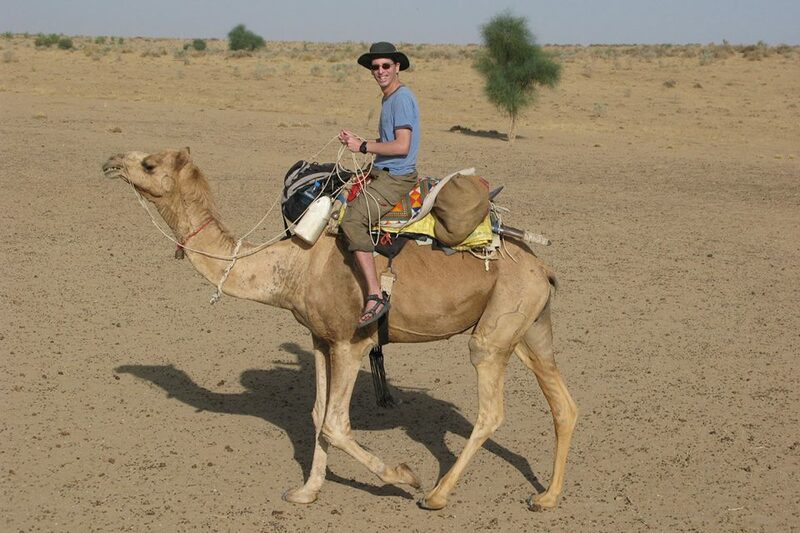 Tony and I did a 3-day camel safari, and absolutely loved it. This unique experience is for desert dreamers who want to gallop through the scrub like a modern-day Laurence of Arabia. Janta Sweets is arguably Jodhpur’s most famous sweet shop and restaurant; it’s always bustling with locals drinking chai. While its name might suggest otherwise, Janta Sweet Home offers a wide range of Indian delicacies including savory snacks. It’s the perfect place to sample anything from a spicy mirchi bada (hot, deep-fried pepper) to a variety of milk-based sweets with delightful ingredients such as saffron, cardamom, and rose syrup. To order, just point at anything that strikes your fancy. Enjoy! One of the ultimate places to visit in Jodhpur for spectacular views of Mehrangarh Fort and the Blue City is the Jaswant Thada Cenotaph. It’s a short pleasurable walk from the old town or the fort. Besides the views, the royal tomb is a tourist highlight in itself. Built out of thin sheets of polished marble and featuring carved lattice screens, the cenotaph practically glows in the early morning sun. It’s a wonderfully peaceful spot, which we highly recommend for starting your day. Lovely. 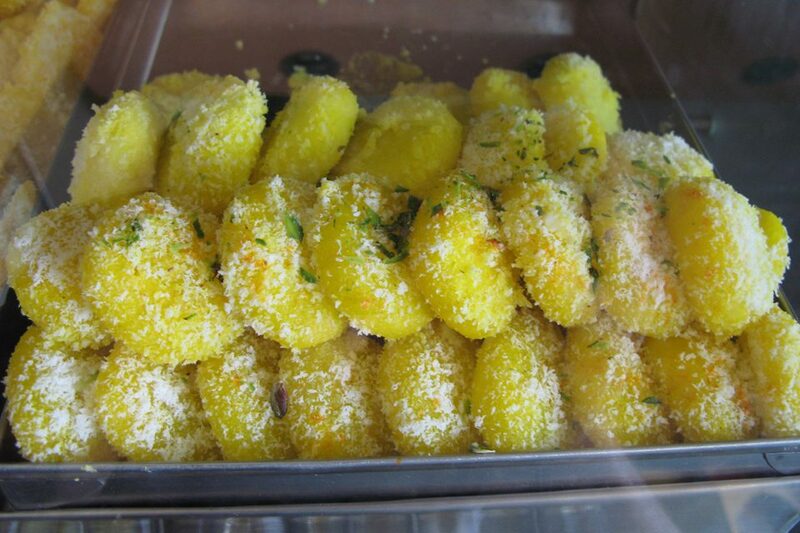 I want a saffron lassi…. That’s something we could probably find in San Diego as well. So next time we are all together, let’s hunt for saffron lassis!